Every time you want to stow something on one of your many pack apes, just fill in a slot. Once the slots are all full, the poor thing can't carry any more. The slots are meant to be roughly 7.5 pounds, or half a stone. There are 45 here which works out to ~337 lbs. 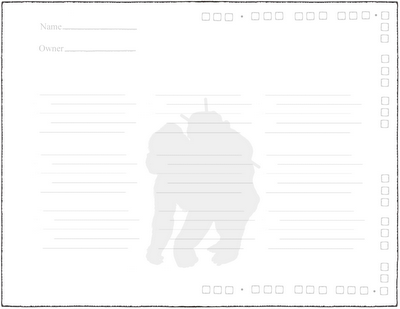 This is based on someone with 18/00 strength in 1eAD&D being unencumbered, with the idea that the ape will be able to climb, swing, and move around freely with this much weight packed on. Thanks to Darnizhaan for that strength suggestion. The grey checkboxes can be darkened when you determine the beasts hit points. Then if it happens to take some unfortunate damage, cross off a box for each point. There should be enough boxes for the hardier carnivorous apes (~5HD) if that's how you roll. Donkeys come in many breeds, but this is aimed at the smaller, burro types to distinguish it from the mules. With 12 slots they can hold ~90lbs. They should also be able to get by with very little food, though stubbornness might be an issue. 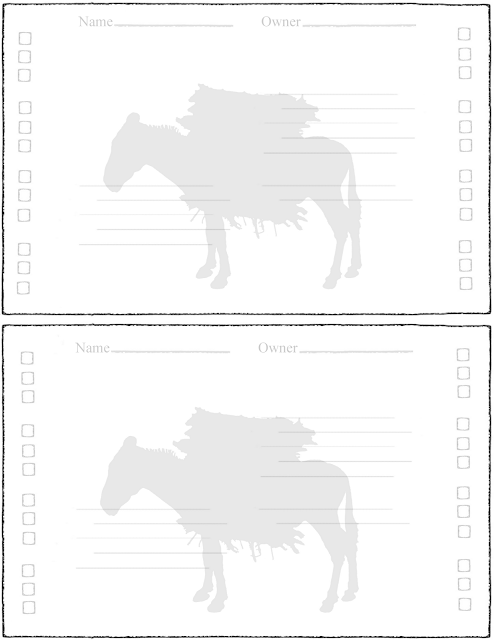 In talking about the possibilities making these pack animals less abstract could open up my buddy said "Man, I'd love to play a game where I had to eat my donkey." I'm working on it, haha. I'd prefer to give you tools to make your own beasts of burden. But I can't think of an easy way to do it. I thought of just making up a sheet with slots on it that you could darken to the number you want but 1) that's essentially lined paper, and 2) it gets rid of the main point of these-- letting players tell easily what beast type it is documenting and how much it can carry in comparison to the others. So for now I guess I'll just keep making beasts that tickle my fancy or that you mention. These are incredibly cool, thanks very much for making them. You don't happen to have any PC character cards that are about the same size? Do you mean a sheet that would be for a burden-carrying hireling? 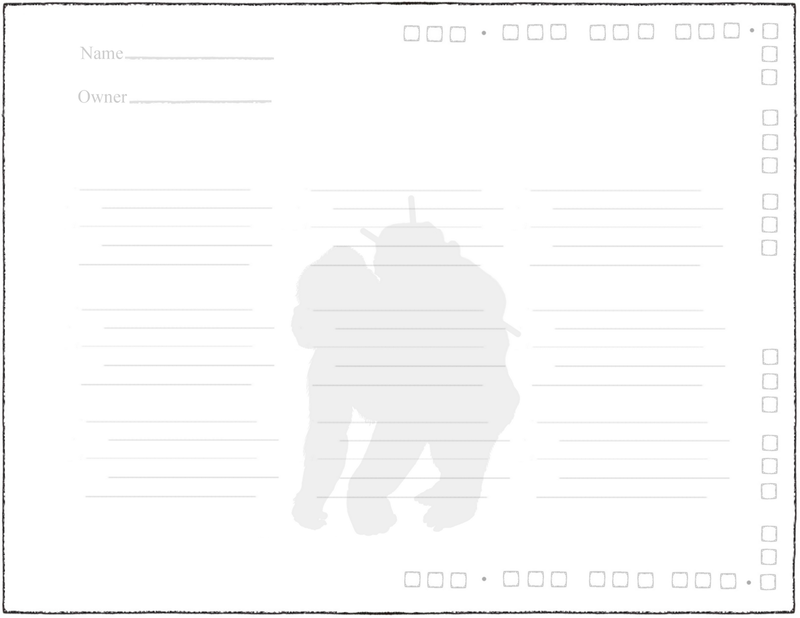 Or a sheet that is similar for PCs, in that it has a silhouette indicating class and checkboxes for hitpoints? I don't, but could. Let me know what you are after, but give me a few days because I'm heading to San Diego for a conference tonight. Won't be back until Sunday. I meant a character sheet for the PCs, with stats, AC, HP and all that. The folding character sheet looks like it does the trick. Many thanks. I'm back it town. I found a couple new pics of porters last night. Those and the bearer silhouettes I already have should make for a motley safari crew. Thanks for the suggestions, anon. I agree pay and moral would be good o have on there. I imagine different DMs might handle those in different ways, so I'll probably just leave a line, rather than something more sophisticated.